This is not a reference to one of the late-great alternative music bands of all-time playing in one of the late-great alternative music cities of all time. But rather artistry of a different kind. 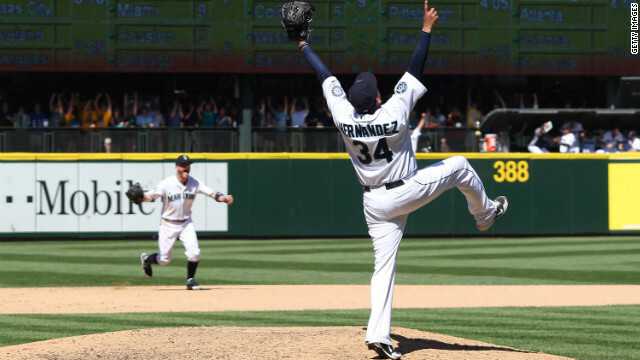 It was just a matter of time before Felix Hernandez did something he'd never done before - a perfect game against Tampa. It was also the 4th CG SHO for King Felix in 2012. The 26-year old Venezuelan already has 96 career wins and is certainly on the fast track for baseball immortality, had he not written his name in permanent marker yesterday. I've known Dave Sims for over 20 years. He was a sports radio host in New York before he got started in play-by-play. I was his spotter and stat guy on the Big East Football game of the week in 1992 & 1993, when he was very new and inexperienced at this. I was also very new and inexperienced at what I was doing, but it didn't stop me from teasing him about his obsessive-compulsive, color-coated charts. He carried around so many different pencils, pens, markers, and highlighters that I joked he knocked over an Office Depot on the way to the stadium. But this is where it all pays off. The details are what makes this a work of art as well. The green highlights mark the strikeouts (he whiffed 8 of the last 12 Rays) and the circled red numbers indicating how many retired in a row (that's 27 by the way). And all the zeroes, of course. 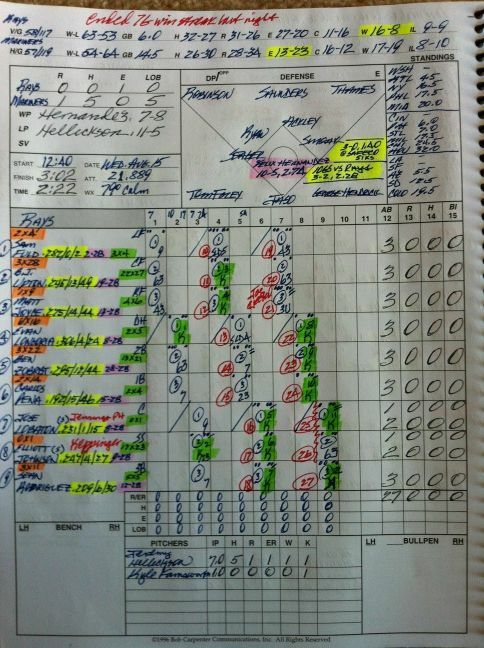 Having this much information crammed into a small space is what makes a good play-by-play guy have all the stats and info at his fingertips. But as often is the case, it's the empty space you fill in during the game that paints the most telling picture.